As an intern, you will be working temporarily for a Nunavik Regional Organization*. The main goal of an intern is to learn and develop their working skills. The expectations of an intern is to be present at work, motivated, dynamic and willing to learn throughout the entire internship. You will be paired with an experienced employee from the organization, who will be your mentor for the entire duration of the internship. Your mentor will be responsible for assisting you in your tasks and supporting you through the personal objectives you will have set for yourself. * At this time, preliminary talks have been held with KRG, KSB, Makivik, NRBHSS, Ungava Tulattavik, Innulitisivik and KMHB. Joining Pijunnaqunga has many advantages: it is a different way to try new jobs and gain valuable work experience. You will also add value to your resume and develop important work skills. Within Pijunnaqunga, you are not alone: a mentor will be with you for your day-to-day activities. Plus, the internship coordinator will always be available to assist you in any obstacles you might encounter. Becoming a Pijunnaqunga intern is an awesome opportunity to discover what you are good at and find your passion! 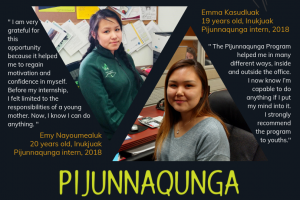 Pijunnaqunga internships are all paid at a minimum rate of $20/hr. Travel and lodging expenses for the interviews and the training sessions will be covered by Pijunnaqunga, including training allowances. If you are motivated to work and are serious about improving your knowledge and skills, then Pijunnaqunga is for you! We’ll provide you the support and training to be able to successfully complete your internship and show the regional organizations what you may be able to offer them. Who have completed their high school studies without entering college. Individuals who demonstrate great potential to succeed in this program, but do not match the previous criteria, might be considered. Post-secondary education is THE priority within Pijunnaqunga. If you recently made the decision to leave post-secondary school, you must have been out of school for at least 6 months prior to applying for Pijunnaqunga. Along these lines, we will provide you support if you choose to further your education and will be glad to consider your decision to return to school as a great example of success within our program. Complete the application form and submit two reference forms. Undergo a phone interview, followed by the in-person interview. Each step of the selection process is crucial and requires preparation. All necessary information and recommendations to improve your chances of acceptance in the program are described in the guide “How to become an intern”. At the end of this stage, successful candidates will either graduate to the next phase or be informed of the elements that need to be improved to be considered as an intern at a future point. Feel free to contact us if you have any questions or inquiries. Pijunnaqunga is waiting for you. Atai! Each Pijunnaqunga intern will receive a 10-day training before beginning his/her internship. Through workshops, role-play scenarios and interactive activities, you will develop work skills and acquire knowledge essential for a successful and rewarding internship experience. The main goal of the training is to develop important soft skills and other priority skills required for working in a regional organization, such as the use of different software and how to write emails properly. Thanks to Akinasi Partridge for the design!